So… Who wants to pattern test for Hatchlings Patterns?? After weeks of drafting, digitizing and writing instructions, I am looking for sewing pattern road testers to test my newest pattern due for release shortly, this is my first ladies pattern (one for the mamas) so I need all new testers to put it through it’s paces. Do pattern testers get paid? Sadly no. Pattern testers do it for the love, a free copy of the completed pattern, and my eternal gratitude (also any relevant blog links, social media shout outs etc). You would to take the time to sew up the pattern from the instructions and write up some feedback for me. You do not need a Facebook page with 50K followers or a super popular blog, but some solid photography skills and a model to show off your creation, to us and the pattern buying public, would be greatly appreciated. Do I need to be a certain size to be a tester? We are looking for testers in every size that the pattern is available in. Check out the size chart below for available sizes/measurements. Do I need to be in Australia? Nope, not at all. As our patterns are sold all around the world you can be anywhere. You do, however, need to be fluent in English so that you can proof read our instructions. So what would I be testing? 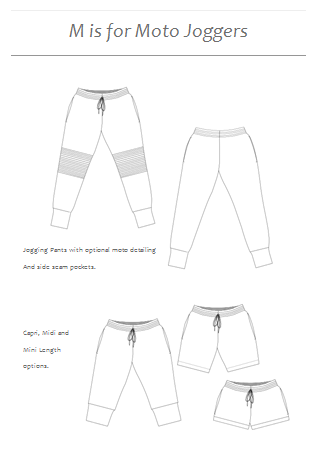 M is for Moto Joggers is a multi-sized ladies jogging/lounge pant pattern with moto detailing (optional), side seam pockets (optional) and an elastic waist band. The pattern is designed to sit 1 to 2 inches below the natural waist, with extra room across the hips, a very slightly dropped crotch and skinny/tapered legs. It includes several different length and cuff finishing options and the option to add a decorative tie to the centre front. Sounds fun, how do I sign up? Thanks so much for your interest in Hatchlings patterns. wearing with “heels” not heals. Hi there! I’d love to sign up but looks like the form is no longer there? Am I too late?! Thanks for your interest, I have enough testers this time but if you follow the blog I will give a shout out next time I need testers.